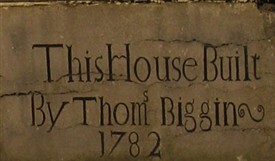 1782 inscription on stone at archway at the beginning of Ballyglass Rd. “As children growing up with Irish Catholics in the Chicago area in the 1950s, we were never quite sure we were one of them. My Dad said we were Irish, but the name Biggins just did not sound Irish compared with Murphy, Kelly, O'Connor, Maguire, etc. When you told people your name, they would ask how to spell it, or say it sounded English. Through my whole life, I only met one Biggins who wasn't a relative: John Biggins, an executive with the Elgin Watch Company, whom I caddied for around 1953 when he was a guest at Indian Hill Club in Winnetka". In 2002, Peter retired and got hooked on genealogy. “The first eye-opener was my great, great grandfather's first name in the family Bible--Patrick. That sounded real Irish. I found books in the library by MacLysaght and Woulfe that not only listed the name Biggins but, said it came from the Irish word beag which, ironically, means small. 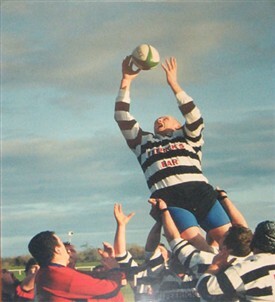 “Research prior to my 2006 trip to Ballinrobe indicated that there was a Biggins Bar in Ballinrobe. The existence of this establishment was a major reason for selecting Ballinrobe as a base for Biggins family research. Biggins Bar is on Bowgate Street, which is an informal section at the south end of Main Street. The first night I went to Biggins Bar and introduced himself to John Biggins, the proprietor. I also met a first cousin of John Biggins, known as John Joe Biggins, who had returned not long ago from working in Dublin at The Stephen’s Green Hibernian Club founded in 1840 by Daniel O'Connell and others…. I did research at Biggins Bar every night for six nights, enjoying a couple pints of Guinness each night. I was able to verify what my brother Bill had always told him, that Guinness tastes best in Ireland. Bill had travelled to Co. Mayo following his discharge from the Navy during the Viet Nam conflict. "Biggins Bar is a favourite place to purchase flies for fly fishing. John's father Sean was an avid fly fisherman. After his father's death in a car accident in 2003, John established the Sean Biggins Memorial Cup for the best Ballinrobe angler in the annual World Cup Trout Fly Angling Championship at Lough Mask, a few miles west of Ballinrobe". Peter continues…..
“John Biggins says that Biggins Bar is the oldest continuously operating bar in Ballinrobe. As indicated on the sign, it was established in 1863. It originally was in the Farragher family. The first Biggins proprietor was John Biggins, grandfather of the current owner, who married Mary Farragher. According to a 1987 guide to the history and folklore of Ballinrobe, Itchy Feet & Thirsty Work, by Bridie Mulloy, Biggins Bar "is possibly the oldest license in town. 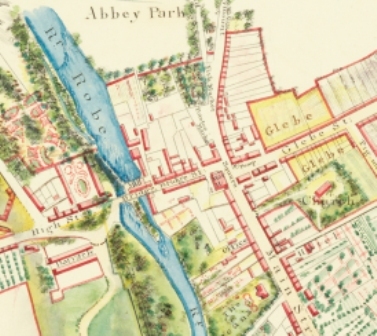 The license was originally for a house in Brewery lane - off Bridge Street - but through the goodwill of Colonel Knox, for whom Sean's maternal great grandfather was gardener, a house was leased in Bowgate Street which still prospers." 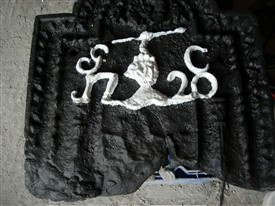 This page was added by Averil Staunton on 12/03/2011. My Grandpa is Jack Biggins, but I think he just went by Jack; his real name was John Biggins married to Arline who said we still have family in Ireland. I guess so. I will be there soon to meet them. Hi me again from below. I have now completely hit a brick wall but from my comments below I found that my Sibana was not Lenskin but LYNCH, I have now found a branch from the family living but still do not know who our Patrick was married to or if we have any Irish descendants left in Ireland. My Biggins family moved to Bury Lancashire about 1855 and worked as builders. My John (born 1840 ish) married Sibana Lenskin? in 1856 and appear in the first census in 1861. On the marriage cert both had fathers called Patrick (we don't know their mothers names). They went on to have a large family, girls and boys(William, Patrick, John - my great grandfather, and Dennis, Margaret, Mary, Julia, Bridget and Annie). No other Biggins came over of a similar age and I am at a loss to know if all his siblings had stayed in Ireland or died in the great famine. My maternal grandfather was also named John Biggins but he grew up in the US. His father (my great-grandfather) returned to Ireland. My mother remembered that the family was from County Mayo, so I've assumed that the town must be Ballinrobe. 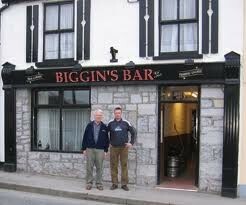 I made a visit in 1999 with my husband who took a picture of me with the folks at the Biggin's Bar. We sent them a copy and I received a reply that they hung it up in the bar. I haven't had time to research my genealogy. Fantastic, my gran, Mora Hogan formally Biggins, has just returned form a visit bringing your 2013 calander back with the website address. Great to read about my family history. Sean is my grans brother and John her nephew.